A beautiful piece of jewellery created in 99.9% pure silver. A unique and lasting gift for parents, grandparents, someone special or the person who has everything! The ideal gift for birthdays, christenings, mother/fathers day, anniversary, engagment, wedding or any special occasion. Anyones fingerprint can be made into silver jewellery, baby, child or adult. I can create a special piece of jewellery for you to wear on your wedding day. Pendants and bracelets for the bride and bridesmaids, cufflinks for the best man and groom or a special momento for the members of the wedding party. 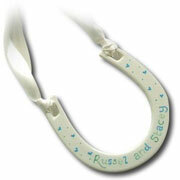 Each item can incorporate name (dependant upon the number of letters), date and fingerprint on each piece. Send me a leaf from your wedding bouquet or a bouquet from a special occasion and I will recreate it in beautiful solid silver. A Guest book with a difference, this is a lovely way to remember your special day. Choose your celebration platter from a range I have to offer, browse through my many designs, or I can adapt your Wedding design and then choose your colour scheme. I will then paint your chosen design in the centre of your platter, you then take this to your Wedding reception and ask your guests to sign the rim. 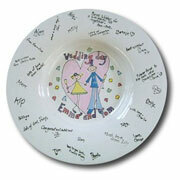 I will then paint over the signatures in ceramic paint, glaze and fire the platter, giving you a beautiful keepsake of your special day which can be displayed in your home. Karen, Thank-you SO much for my stunning rose leaf you made me from my wedding bouquet. It was such a unique item, it's always a talking point and is a lovely momento! Also, for the cufflinks you made for my husband and best man and the necklaces for the bridesmaid's - they loved them and they still wear them now. It's such a lovely idea and you were really helpful with very short notice! Thanks again, Alexandra and Mark, Worcester.